Stress Testing and Risk Integration in Banks provides a comprehensive view of the risk management activity by means of the stress testing process. An introduction to multivariate time series modeling paves the way to scenario analysis in order to assess a bank resilience against adverse macroeconomic conditions. Assets and liabilities are jointly studied to highlight the key issues that a risk manager needs to face. A multi-national bank prototype is used all over the book for diving into market, credit, and operational stress testing. Interest rate, liquidity and other major risks are also studied together with the former to outline how to implement a fully integrated risk management toolkit. Examples, business cases, and exercises worked in Matlab and R facilitate readers to develop their own models and methodologies. Tiziano Bellini received his PhD degree in statistics from the University of Milan after being a visiting PhD student at the London School of Economics and Political Science. He is Qualified Chartered Accountant and Registered Auditor. He gained wide risk management experience across Europe, in London, and in New York. He is currently Director at BlackRock Financial Market Advisory (FMA) in London. Previously he worked at Barclays Investment Bank, EY Financial Advisory Services in London, HSBCs headquarters, Prometeia in Bologna, and other leading Italian companies. He is a guest lecturer at Imperial College in London, and at the London School of Economics and Political Science. Formerly, he served as a lecturer at the University of Bologna and the University of Parma. 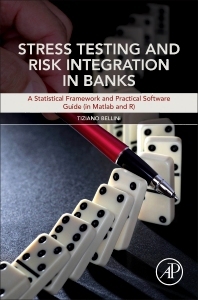 Tiziano is author of Stress Testing and Risk Integration in Banks, A Statistical Framework and Practical Software Guide (in Matlab and R) edited by Academic Press. He has published in the European Journal of Operational Research, Computational Statistics and Data Analysis, and other top-reviewed journals. He has given numerous training courses, seminars, and conference presentations on statistics, risk management, and quantitative methods in Europe, Asia, and Africa. The book is self-contained, has technical details and is very well structure. I highly recommend in particular for anybody working on the financial Stress Testing exercises.